What is better than honey and butter together? Very few things are better than honey and butter, maybe peanut butter and chocolate, pizza and beer, macaroni and cheese. List goes on and on. You have seen my love of carbs in previous post but my real love is fresh hot bread. The yeasty taste just makes me happy dance. Most of the time store bought bread falls flat in the flavor department. They maybe have honey wheat bread, potato bread, raisin bread and lately I've seen Hawaiian bread that you can buy in a loaf style. But nothing comes with flavor that make me say WOW. These bread will do it. This recipe is like a sourdough starter a Poolish but doesn't take as much time to make but you still get the flavor of it giving it a slight tang to it and the honey give it a slight sweetness. 1.) Combine yeast, flour and water together. 2.) Loosely cover with a lid or plastic wrap or an clean shower cap. A sign that the mixture is alive, if the dough moves once it is fully mixed its alive. 3.) Set aside in a slightly warm place for at least 18 hours. 1.) Combine honey, salt, bread flour, 2 cups warm water and butter to the proofed polish. Mix well with a spoon. Don't worry if the dough is sticky and butter is still in cubes, the butter will melt in the next step. 2.) Sprinkle all purpose on a clean surface, tip dough over and knead the dough for 10 to 15 minutes. If your using a stand mixer skip this step. 3.) Grease and flour same bowl. 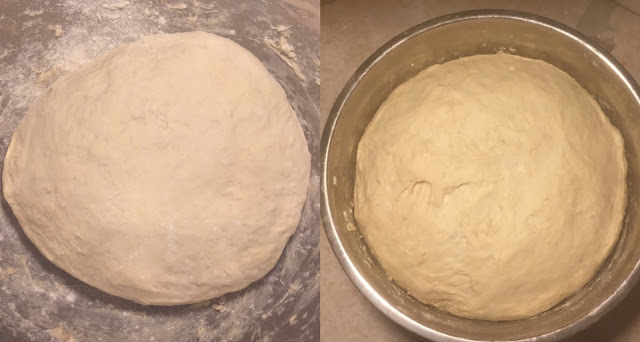 Place dough back in the bowl and cover for 1 1/2 to 2 hours or until it doubles in size. 4.) Prep loaf pans with nonstick cooking spray and flour. Once the dough has doubled, tip dough on a slightly floured surface. Gently stretch out into a rectangle. Cut dough in half then roll into a log. Pinch and tuck the ends. 5.) Place into loaf pan and let it proof for 1 hour. Do not cover. 6.) Remove top rack of your oven and lower second rack to the bottom of your oven. Preheat oven to 350 degrees. 7.) 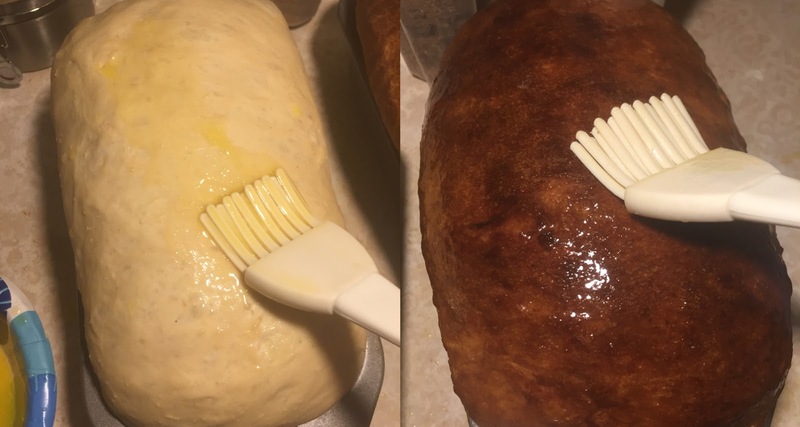 Brush loaves with melted butter. Bake one loaf at a time for 25 to 30 minutes or until golden brown. If its browning fast after 15 minutes cover with foil then bake for another 10 minutes covered. 8.) Remove from oven and brush the top a little a butter. Allow the bread to cool in the pan for 10 minutes then remove from pans and let it cool completely on a wired rack. The bread may be stored in a bread bag or a plastic wrap for up to a week, it can also be frozen for up to a month. Enjoy as a sandwich, grilled cheese, panni, or just buy the slice. Honey butter bread sounds incredible! I absolutely adore fresh bread anyway and the smell when it comes out the oven.. omg. 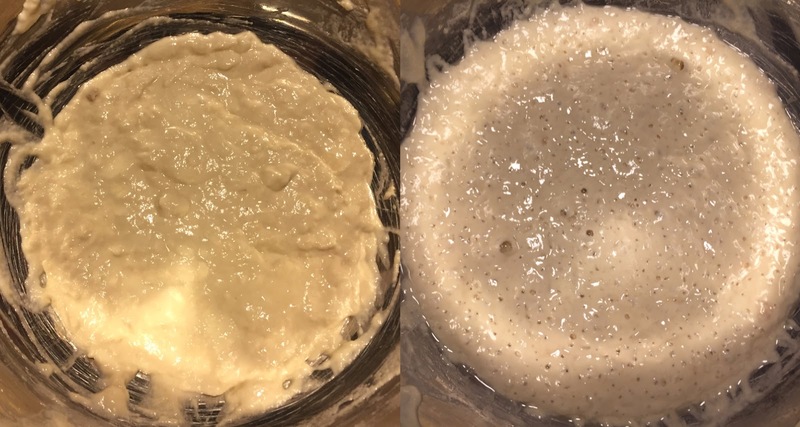 I make sandwich bread weekly, keep sourdough starter but have never tried poolish. This looks delicious! Thanks for sharing. Honey and butter combined in bread looks like a great combination. Kids will love sandwiches made from this bread. I love the combination of honey and butter, so I can only imagine how delicious this bread must taste. I need to make it, soon! I am a big bread eater, and this looks absolutely delicious. I am so with you - what could be better than honey and butter?! This looks heavenly and perfect to eat anytime. Nothing like homemade bread specially when is hot right of the oven yummy! I love making homemade bread. This looks so nice and "squishy" good. Would love nice warm slice with butter. Yum!! This looks like bread my mom used to make! Yum! I'm not the best bread baker. But these instructions look so easy and it looks delicious! I have to put this on the menu. This looks delicious. I would add our famous cinnamon butter on there and it would be perfection! Yummmm...I can already smell this baking!! I don't think much will ever beat peanut butter and chocolate for me, but warm fresh homemade bread drizzled with honey is a close second! I haven't made bread in ages, you are motivating and make me want to pull out my pans! I love baking bread, it is so therapeutic and makes the house smell like HEAVEN. Honey butter bread is one of my favs.!! I love bread. This recipe looks delicious. I will save it to make during the weekend. Honey butter just makes the bread sound good right at the get go! This sounds delicious and having it fresh out of the oven would be great! Looks delicious, though I can't knead dough for too long, I get distracted. Luckily there's tons of tasty breads here in Prague shops. Surely the honey in there helps with the puffiness and the nice color of the bread! I'll try this out for sure! 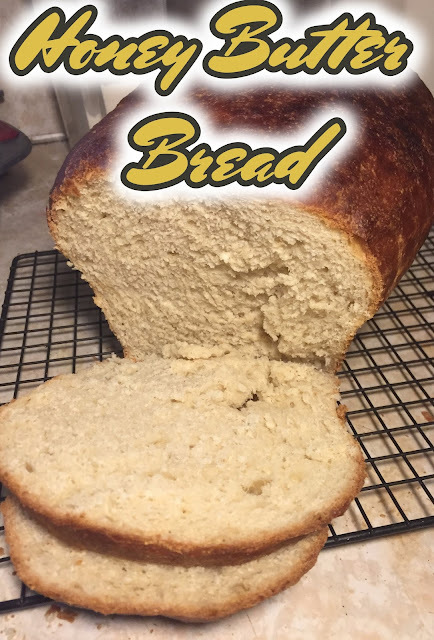 I love honey bread! I'm so glad I found this recipe, I'll need to make this right away! I have never made my own bread, but freshly baked is always the most delicious. I really need to learn! And yes, honey and butter = a great combination!! It's been so long since I've made bread. I love how it smells so good while baking. Honey & Butter sound so good. I have never baked bread. I would love to try this. Okay so bread is my TOTAL weakness! And this looks SOOOOOO good!!! Gah! I have to try this recipe on my cheat day! It looks delish! I honestly miss baking bread because I always knead manually and I rarely can find time now. I would want to try this. My oldest is my carb lover. Bread is her favorite food! I need to make this honey butter bread with her. It sounds lovely. This post reminds me of my childhood when my grandmother used to always make fresh bread (it was the best!) I'll have to try this one out, thanks for sharing ; ) honey and butter make the world a happier place to live in! Fresh bread is the best! I need to start making some myself. it's so easy! One thing I haven't tried yet is to make my own bread, and this one looks like the perfect way to start! I do love the smell of fresh bread, and I love to eat it with butter, it is so delicious! I have baked some honey butter bread in the past. It was delicious. And then I made BLT sandwiches out of them with home grown tomatoes and specially cooked and cured bacon, plus homemade mayo. It was amazing. There is honestly nothing better than home made bread! I have made my own bread in the past, but since going gluten free I have been afraid to try. These looking very tasty though! And super easy! Yum! This sounds like the perfect recipe for the upcoming chilly months! I have been craving carbs all weekend, and now I've seen this I will have to give it a go!!! Oh my. That is a delicious looking loaf of bread! Thanks for sharing the recipe. I am with you. Nothing tastes (and smells) better than fresh homemade bread. I love homemade bread and this looks so incredibly delicious!! I love this combination. I haven't baked bread in years. This bread sounds delicious! I'm now a follower. I love honey butter bread! Thank you for the great recipe! I'll be making several loaves this week to celebrate that fall is almost here. The only homemade bread I've made in the past is bananna nut bread. 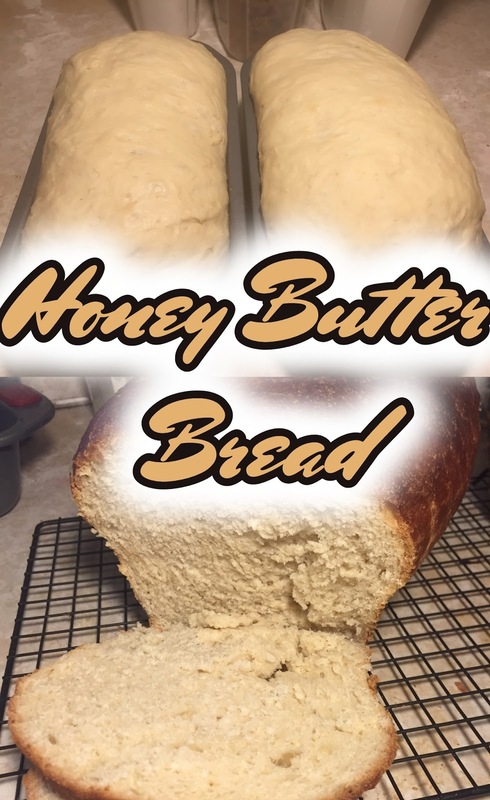 Although I plan to bake this Honey Butter Bread because it looks delicious and easy to make. I couldn't agree more. Honey and butter are the perfect pairing and love that you combine that with some homemade bread. yum! I used to make homemade bread frequently when my kids were young (they are all adults now). We homeschooled, and made "home economics" part of our curriculum! So they always helped with tasks like making bread and other food. Of course, they especially liked the kneading and punching dough parts of making bread! I usually make sandwiches at breakfast. Your honey and butter bread is amazing. The recipe for bread is quite easy but it's delicious. This bread looks simply divine! One thing that seriously has helped me get through the tough Minnesota winters after I moved here... is bread baking! Yes, all the carbs, but hey...at least they were all natural, coming straight from my own oven, right?! :) :) :) Glad I'm not the only one who adores the carbs. This is exactly what my dreams are made from! Yummy! I am on a low carb diet plan right now and this recipe and pictures are killing me! My boyfriend loves to bake homemade bread. I bet he'll love this recipe! I have had the worst luck trying to make my own bread. This looks so good though! I'm a huge fan of honey butter cornbread. I can't eat gluten and one of the things I miss the most is fresh bread and bagels. You can make gluten-free versions but it is totally not the same. This looks delicious..
Homemade bread is the BEST. I make it once a week at least! I'm loving this recipe! I love the mixture of honey and sea salt! That sounds absolutely amazing! Oohh I've never tried Honey Bread before, this looks delish! Definitely something I'll have to try out! This looks absolutely delicious! love it! thanks for the rceipe! I've never baked bread before, totally intimidated by the process. But your bread looks delicious and easy! Homemade bread is the best, there is no beating it. It looks like you put a lot of care into your blog! I like it! Oh man this bread. I love the smell of homemade bread in the house. It reminds me of my childhood way too MUCH. Love that it is honey butter bread. wowow.. I've never baked bread before but this might be a sign i think :) do you have a post about how it all started for you? My kiddos LOVE bread, so I know they're going to love this baked fresh for them. Thanks for sharing the recipe!